Growing cannabis hydroponically is on the rise. The fact that home marijuana cultivation is now legal in many states no doubt contributes to this increasing popularity of hydroponics as well as more traditional soil cultivation. The spike in innovative products that have hit the market during the past five years creates advantages for home growers that didn’t exist in years past. People who want to learn cannabis cultivation have more support and direction now than ever before. Even people who struggle to keep a house plant alive will succeed if they follow the directions that product manufacturers now provide. Traditional soil cultivation still overshadows hydroponic growing methods and is the way most cultivators of cannabis and other plants cut their teeth with home cultivation. People who want to learn how to grow marijuana likely have doubts about their ability to do so. This is especially true if they don’t have the support from a cannabis-savvy friend who can show them the ropes. Since some aspiring home growers struggle enough with the simple concepts of growing cannabis in soil, the idea of engaging in hydroponics is a bit overwhelming. The idea of growing in a water-based system with material like clay pellets or small rocks is difficult for many to fully embrace with the confidence they will succeed. One company is trying to change perceptions and eliminate the intimidation factor that’s all too common among people who dismiss hydronic growing as being too difficult. Aspen GrowBox now sells self-contained, all-in-one hydroponics systems that all but guarantee success for those who purchase a unit. The Aspen GrowBox system has some similarities to grow cabinets and tents used for soil growers. Units of this size are particularly attractive for apartment dwellers because they don’t take up a lot of space and have automation already built in that makes learning marijuana growing much easier. What makes the Aspen GrowBox system so intriguing is that once it’s up and running, it’s easier to grow a nice cannabis plant or two than it is with a soil-grow cabinet. There is no need for daily maintenance because the system operates on its own. Unlike a soil cabinet, Aspen GrowBox owners can leave town for more than a week with the peace of mind that the plant(s) growing within the box are thriving in their absence. The Cannabis Training University (CTU) recently spoke with Kevin Liang, the owner and founder of Aspen GrowBox to gain a better understanding of his inspiration and motivation behind creating it. CTU: Kevin, you have a strong interest and history in aquascape. How did that interest lead to the creation of the Aspen GrowBox? KL: I started my career with a Japanese-style design of indoor freshwater aquariums. I’ve been in the aquarium industry since I was 14, and developing aquascapes in these aquariums, creating scenery of nature, I came to realize that what I was doing with aquaponics was similar, because the same horticultural practices above water apply under water as well. I would get the same questions again and again while working at Aqua Forrest Aquariums in San Francisco. People would walk in and see these beautiful aquariums and ask how they could create these same ecosystems. Then, fast forward, while I was doing a research project at UC San Diego about the inputs and outputs of large aquaponic systems. I came to realize that what I had been doing under water, aquaponics, was similar to plants that were above water with the roots under water. So that was my introduction to aquaponics and hydroponics in 2012. Since then, I created a kit called Ecoqube. Ecoqube aquariums was one of the most wished-for aquariums this past holiday season on Amazon. It’s intended for a beta or a couple of small minnows. Everyone who saw them would say, “Amazing, I want that! How can I get it?” The stopping point for them was buying all of the parts, cycling the tank, and putting it all together. So, all I did was create a kit and package it all up to create a small aquarium that people can fit into a small space—it can even fit on a shelf. This allows people to have a window to nature. 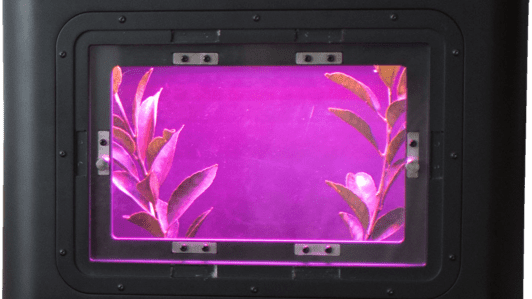 Many people bought this desktop aquarium not so much because they wanted an aquarium, but because they liked the window into nature and some type of greenery on their desks. So (for Aspen GrowBox), we created a greenhouse system without the fish that waters the plants and also helps improve air quality. That was the basis for the GrowBox. In 2016, we created a version of the Ecoqube Air that was 12 times the size, and we gave it to a professional grower to try out. In 11 weeks, we grew 1.4 ounces of cannabis flower. That’s when I decided to focus on it and create an entirely new company to specifically focus on and work on that specific product, and that’s now Aspen GrowBox started. CTU: This seems like something that’s easy to use in an apartment. The activated carbon filter keeps odor down, which is an appealing feature, and the unit is attractive to look at. What advantages do you think a hydroponic system provides for people who are used to growing in soil? KL: There are definitely advantages. One of the most important is that the nutrients can be directly absorbed from the water column. One of the reasons plants require water is that they need water to absorb all of the nutrients, and (hydroponics) allow plants to absorb nutrients exponentially faster and grow much faster because the nutrients are always available in the water. I learned that from growing (a lot) of aquatic plants, because they all absorb water from the water column, some from the soil, but mostly from the water column. Another advantage is that soil can get really messy, and it dramatically increases the chances for bugs and pests, which can be a point of failure for first-time growers. CTU: Your product seems to be a microcosm of what the future holds for commercial as well as home cannabis growers. For someone who wants to get into commercial cultivation, it makes a great introduction on a small scale. It utilizes hydroponic cultivation which ultimately requires less water even though its water based. It also utilizes LED lights, which leave less of a carbon footprint than HID lights and are more sustainable for the environment. It also makes an attractive centerpiece for a living area. The fact that people don’t need to tend to it very often also seems to bode well for beginners having success with growing right from the beginning. KL: When we were designing the system, we were trying to find the balance between maximum yield and ease of use. We could have used larger, brighter, hotter LEDs, but that also leads to the risk of burning the pant and overheating the system. So, we spread out the lower-wattage LEDs and sacrificed some on the yield side to maximize the chances of success for people growing for the first time. This is all part of standardizing the system. The distance of the light in the beginning changes when you switch it to flowering and add the top section. Other than that, it doesn’t really require much attention. And you don’t need to touch it. That’s one of the reasons we chose hydroponics over soil. It’s much easier to control how much water the plant is taking in. CTU: Since the GrowBox is so automated, what are the light cycle choices for growing in the vegetative and flowering stages? KL: The choices for light cycles is 12, 18, and 24 hours. CTU: Right. Some growers grow under continuous light during vegetative growth. KL: Yes, they can do that if they really want to, but in our instructions, we just say 18 (vegetative) to 12 (flowering). Fan speed is high, medium, and low. And those are basically the variables. Cutting out unnecessary things and not allowing people to customize and make mistakes was the goal for people to produce two ounces in less than 15 weeks. We thought about adding an automatic doser to help owners dose their own nutrients, but using a bottle that standardizes the dosing every water change was better. Every time you do the water, you do two pumps, that’s it. Being very focused on making the process very easy, focused, and standardized and allowing first-time growers to succeed was out goal. By cutting out everything we could that’s unnecessary, we were able to produce the most affordable unit that’s out there. CTU: The nutrients you use have pH stabilizers, which also eliminates the need for testing water, so that’s another step people don’t have to worry about. KL: Yeah, exactly. That’s another thing we took out. There is no need for a pH meter and total dissolved solids meter. We only put in meters that are necessary, which is temperature and humidity since those are definitely things you want to know and monitor on a daily basis, or every other day. But as far as pH goes, as long as you do the recommended water changes every seven to ten days, you should be good. Another thing is that pH meters need to be calibrated. Are you going to expect a customer who’s never grown before to calibrate a pH meter? So, we eliminated that need as well. We want to be at the entry level. Just like the Ecoqube, which is an entry-level aquarium, we want people to master the basics of hydroponics. We’re looking to partner with (companies) that sell larger systems, so that when people graduate from the GrowBox, we have some additional offerings for them. Some larger systems will be available to increase yield. CTU: Do you have a target demographic for the Aspen GrowBox? KL: Yes, our target demographic was initially people on both coasts that want to grow their own cannabis—in a similar way that people who love beer want to brew their own. But what we have found is that many people who are interested in our GrowBox are patients who are significantly older than what we expected. These people are sick and live in states where cannabis is recommended to them but they have trouble with access. Many live very far from their closest dispensary. New Jersey, Pennsylvania, Georgia, and North Carolina are some of the areas where they live. I was very surprised, actually. CTY: You have a screen-of-green option to use inside of the GrowBox, which is a component that works very well for larger grow spaces. Has that extra feature been popular? KL: Yes, the screen really helps tuck in the plant as it gets large. When the plants produce buds, it makes it so that they don’t hit the walls when they get big. It improves the plant’s form and keeps it level. It helps by concentrating the plant, which creates more space. When it comes down to it, all you need to do while the plant is growing is top it and change the water once per week. That’s about it. Other than that, the system takes care of itself. I see both the Ecoqube and GrowBox as an easy way for people to be in touch with something living, without a lot of (upkeep). We worked very hard to package that into something that’s beautiful and people can enjoy.